I’ve not been very regular about blogging lately. I’m sure my regular readers may have noticed that already (some of you have sent me messages via facebook). So I feel obligated to confess at the very beginning that I’ve been a bit off my blog. For one, facebook has become so stingy about letting people get views because I refuse to pay for eyeballs. Their logic is that nothing is for free and my logic is that I am not making any money from my blog (it is not a commercial endeavor) so I cannot pay. Second, I have been working on my novel and it has finally reached a point where I am so engaged with it that the characters are now appearing in my dreams! The result has been that I just haven’t had the mental energy to devote much time to the blog. Of course, now FlavorNspice has grown to a point where it is on cruise control. Whether I post something new or not, I get a steady numbers of visitors to the website (and I am ever so grateful for that). I can’t say that I don’t love my blog, it’s just that right now the other baby needs my attention. But of course, I can’t completely neglect this baby so from time to time I take pictures of what I cook and then write up the recipe. Yesterday a friend of ours came over for lunch. I had originally planned to make Lamb Biryani but then she told me that she doesn’t eat lamb anymore and I had to change my plans t the last minute. 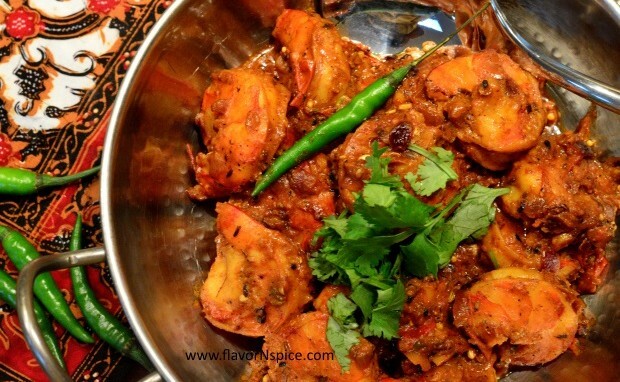 I thawed my stash of frozen jumbo shrimp (yes, I know that is an oxymoron) and made a thick Indian-style curry. 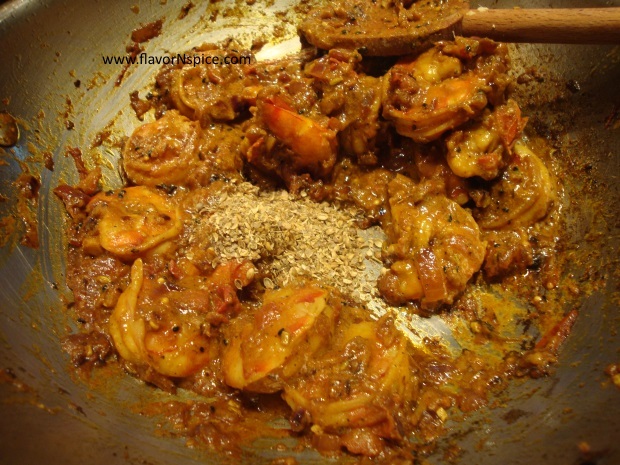 Usually I like to make Goan shrimp curry which has a lot of coconut milk but yesterday I didn’t have any cans of coconut milk in my pantry, so I made a thick (almost dry) curry with some Panch Phoron (a blend of spices popular in Bengal). 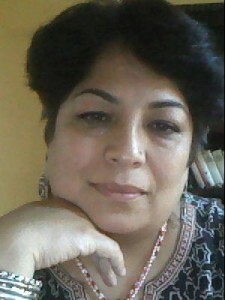 We ate it with fresh homemade paranthas (flat bread). The combination of the two was great. 9. 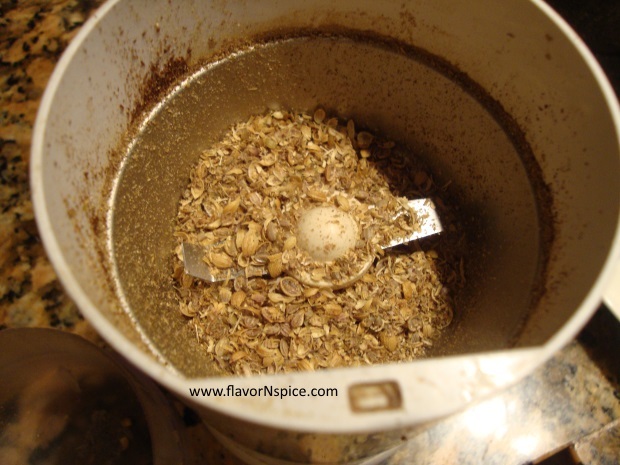 1 tablespoon Panch Phoren. 1. 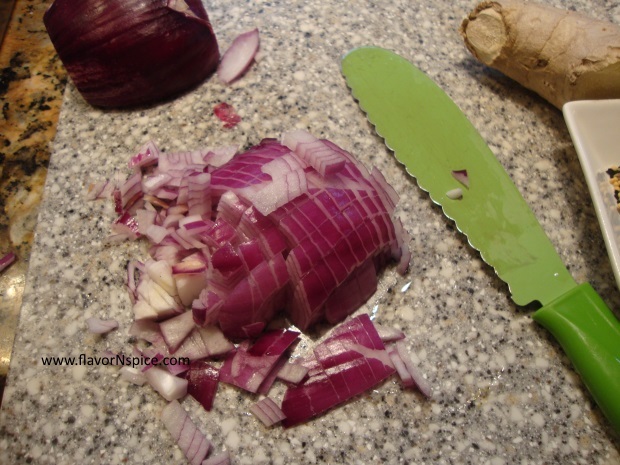 Peel and finely dice the onion. 2. In a heavy bottomed cooking pot, add the oil and heat on low heat. 3. 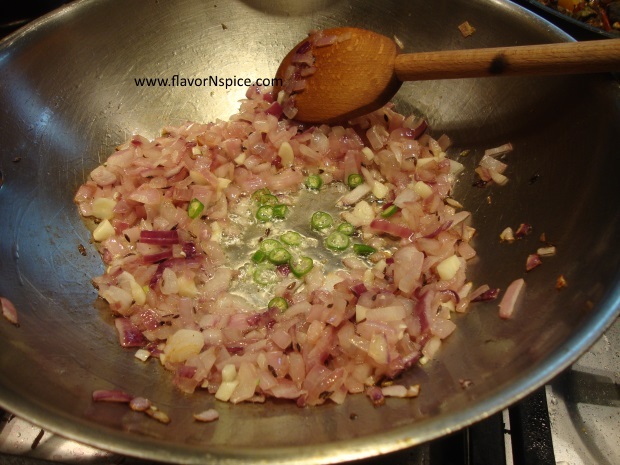 When the oil is hot, add the diced onions to it and stir. 4. 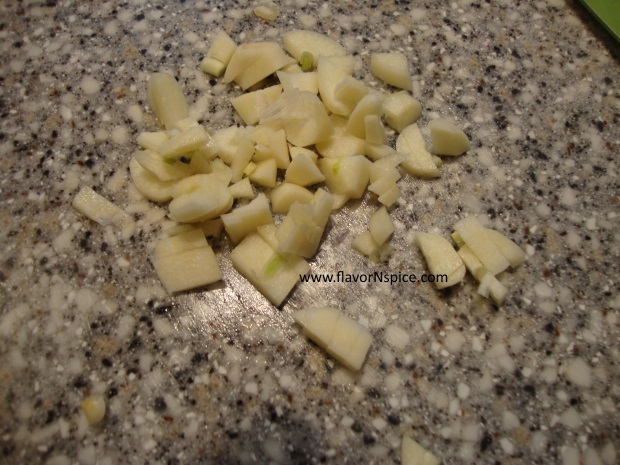 Peel and finely dice the garlic cloves. 5. 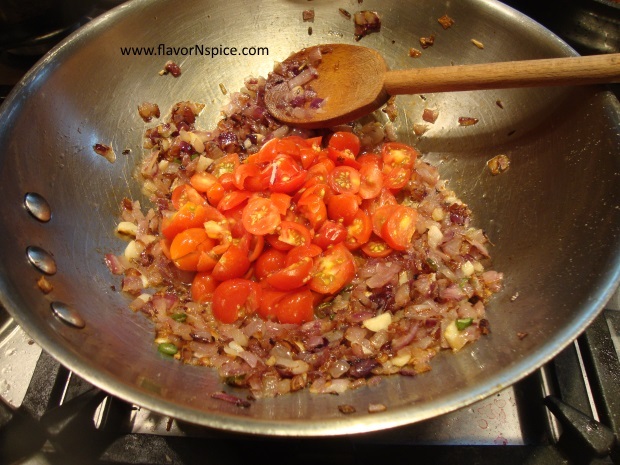 Add cumin seeds and garlic to the pot and stir. 6. Finely chop the green chili and add to the pot. Cook till the onions look slightly browned/ caramelized. 7. 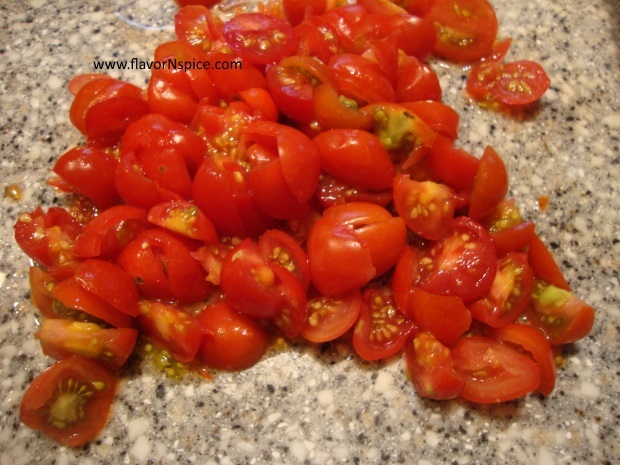 Finely cut the tomatoes. 8. 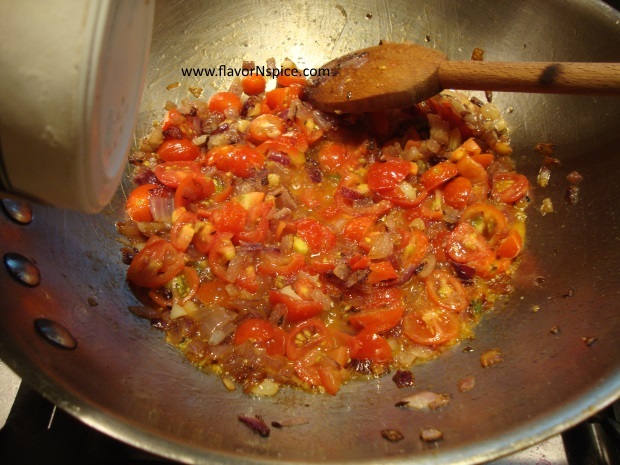 Add the tomatoes to the pot and stir. Cook for 4-5 minutes. 9. 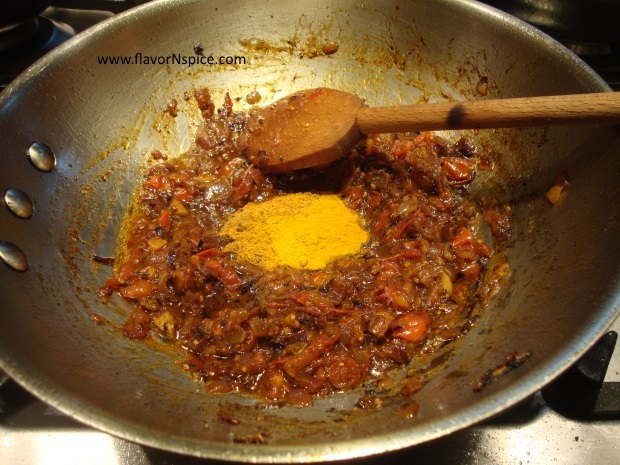 Add a little bit of salt to the pot and stir (it helps to dry out the liquid in the tomatoes). 10. 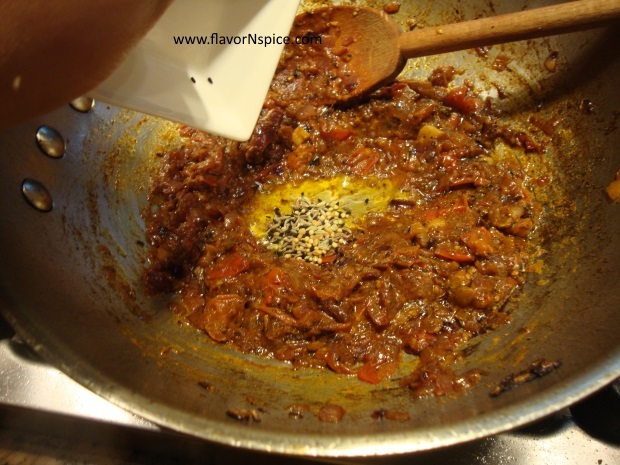 Add the Shan Masala, Garam Masala and turmeric. Stir everything together and cook for a minute or two. 11. Then add the Panch Phoren and stir. Continue cooking at low to medium heat and stir frequently. 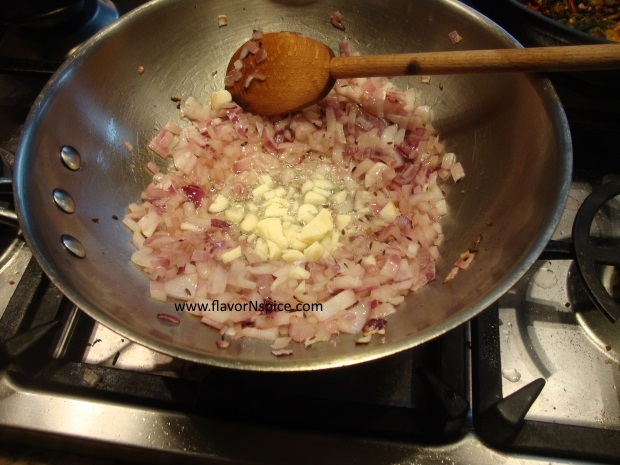 To caramelize the onions you need to cook at low heat and stir frequently. 12. 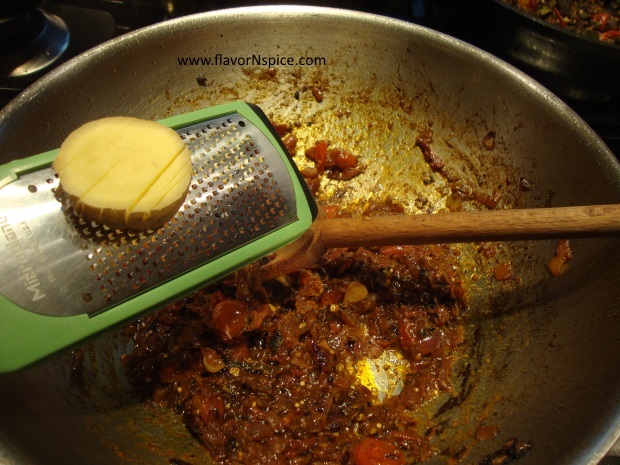 Grate the ginger over the pot and stir everything. Cook for another minute or two. 13. 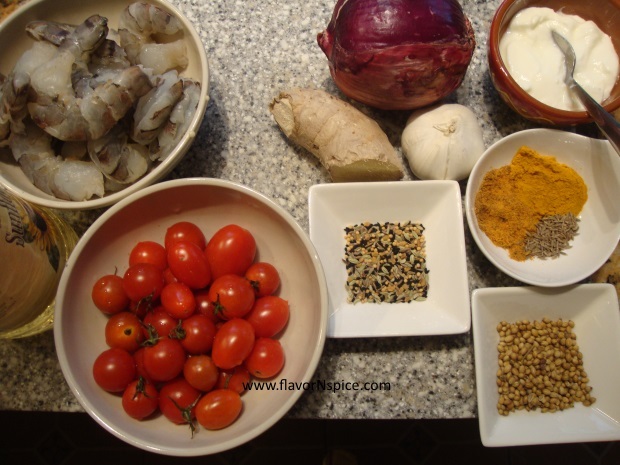 When the onions and tomatoes look cooked to a paste-like consistency (takes 7-10 minutes), add the raw shrimp and stir. 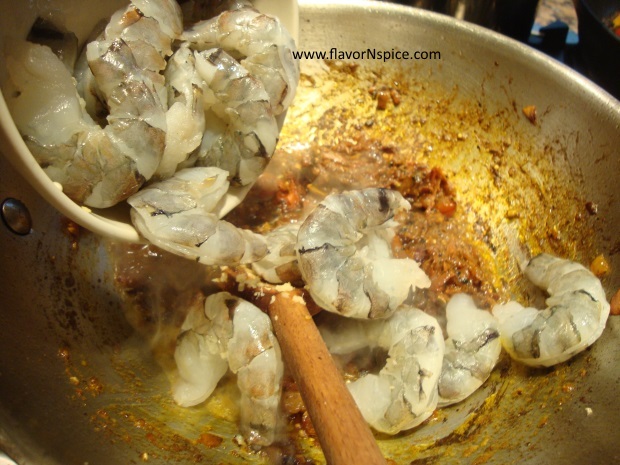 Shrimp cooks very quickly so you need to keep the heat low and to avoid overcooking the shrimp stir frequently. 14. Add the yogurt to the pot and stir. Cover the pot and cook on low heat from 2-3 minutes. 15. 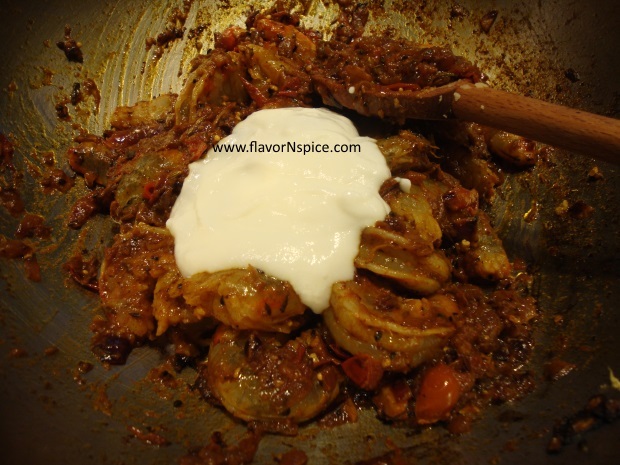 Add the freshly ground coriander powder at the very end and stir again. 16. 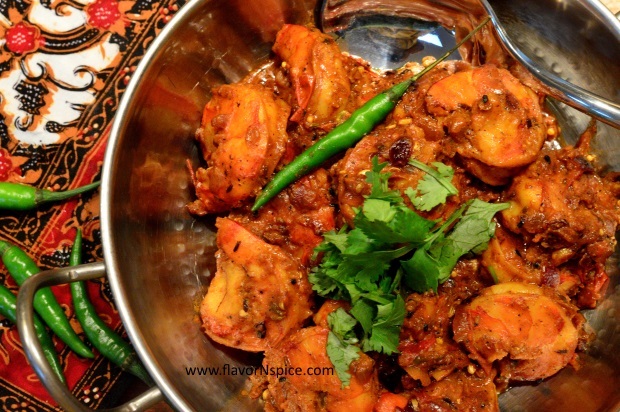 Garnish with some fresh cilantro and serve immediately (otherwise shrimp gets overcooked).